Grandpa had a lot of foresight when the house was built. One of the things he did shortly after the house was built was dig out and put in 3 inch PVC pipes to run the gutter downspouts away from the house. Given that the house sits on a hill, and has fill around the back side of the house, this was a pretty smart option – you run pipe for 10-20 feet and it will come out on the side of a hill. 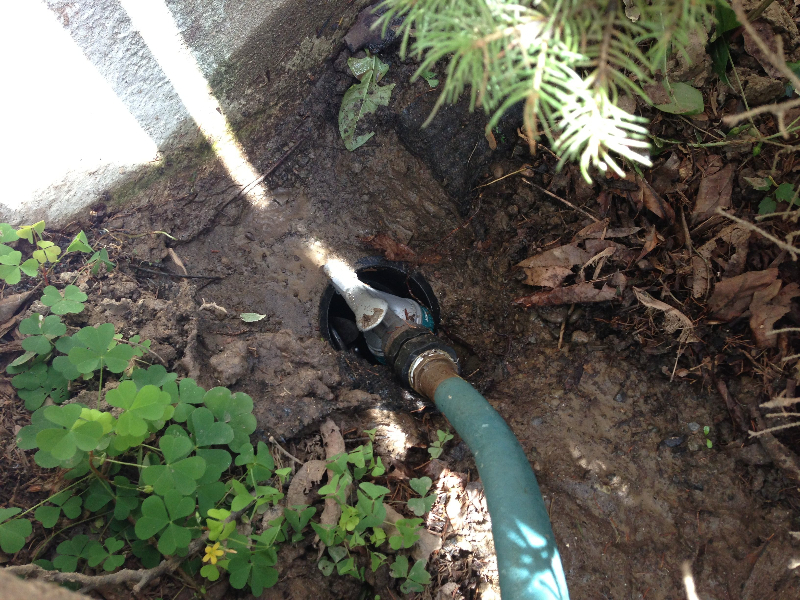 Cleanout is easy – you have access to an open end of the pipe. A few things have changed over the years. First of all – when the house was built there were very few trees around the house. You could literally see off the hill for miles across the valley. This meant no big leaf-in-gutter problems. Today the property has a lot of tall trees, including a group of four shagbark hickory trees. I assure you – they live to clog up the gutters with leaves, nuts, and sticks they drop. Fortunately this is really only an issue on the front corner of the house. And there is the maintenance. 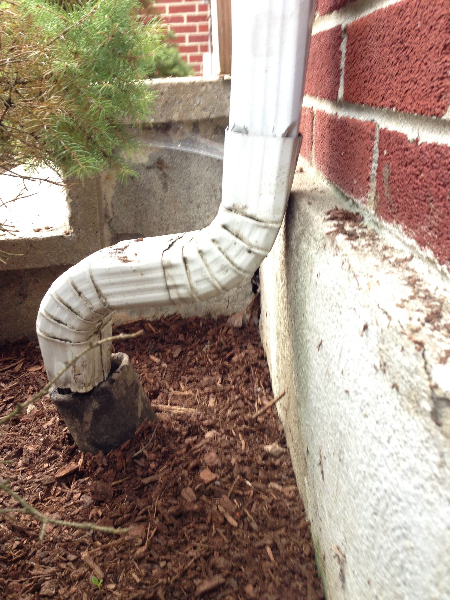 The gutters themselves need to be cleaned out periodically and the PVC pipes need to be checked to ensure there isn’t anything clogging them either. 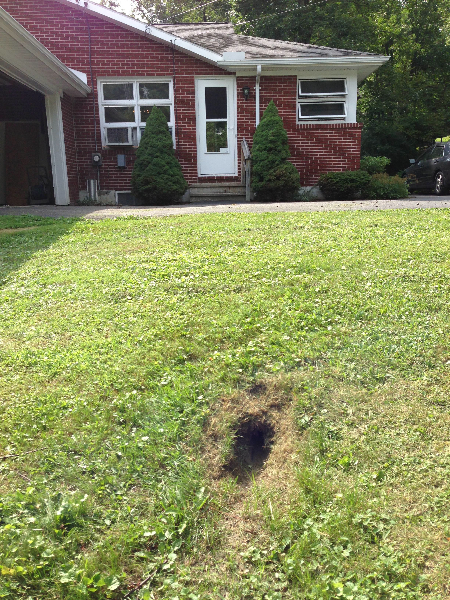 You also need to keep the output location clear – cut back the grass and every year or two dig out the drain field. 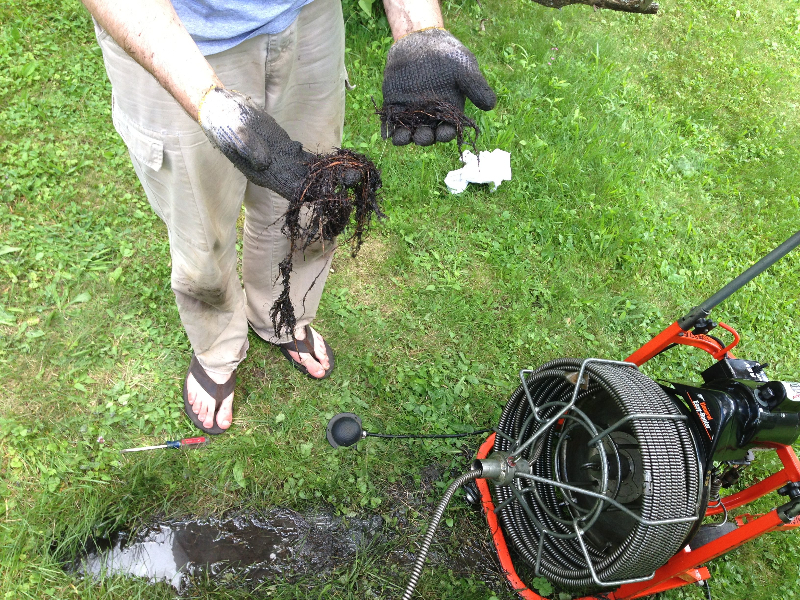 If you’re not careful, sediments (or worse, roots) will clog the buried PVC pipe. I had just such a thing happen with the pipe draining the gutter next to the kitchen door. 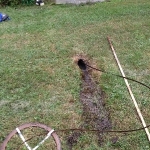 This happens to be the longest one because it runs underneath the driveway, so it is about 50 feet. 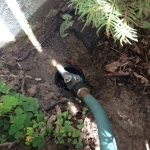 A few weeks ago I noticed when I popped my head out the door (yes, when it rains I check to see if the gutters and spouts work…) and lo and behold, the pipe sticking out of the ground was overflowing. 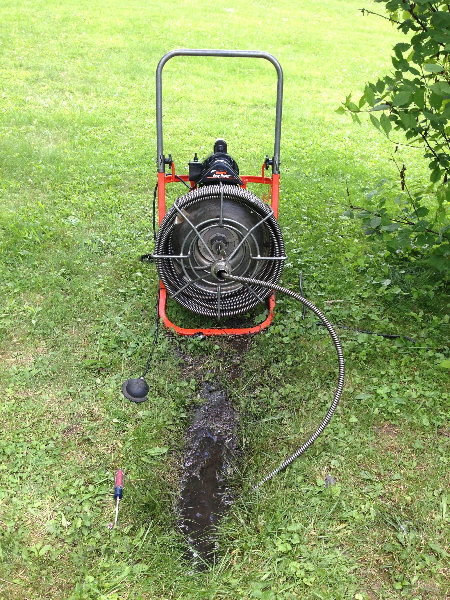 After trying several tools that I have on hand – a long stick, the hand-held drain snake and a 100 foot metal drain tape – I was not having success clearing the clog out of the pipe. 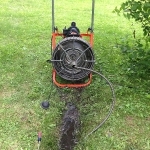 So off I went to our local tool rental shop and picked up a drain rooter. I want to be clear…this thing was clean, but still had the air of grossness about it. I was cleaning a gutter…but you know it has been used for other work than that. Ick. I did my best to put those thoughts aside and get to the task at hand. It took about an hour of working the rooter, but I did break through and cleared the drain. 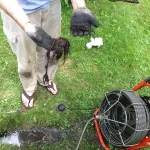 It cost me $50 – a far cry from the $150 I would have paid the chain of drain repair folks to come out and do it for me. And I learned something in the process. 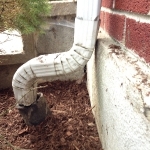 Here are some pictures of my adventure: The dug-out PVC drain end, the drain rooter, the roots that I pulled from the pipe, and the completed downspouts to give you an idea of what I’m talking about. 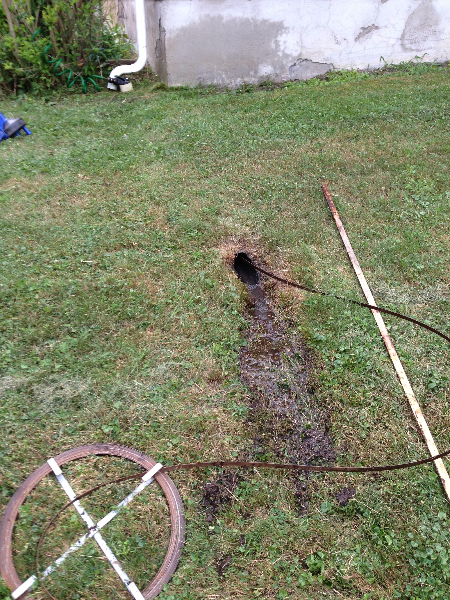 Additionally, one of the shorter runs had a clog too – fortunately no drain rooter needed there. It was a seven foot run and cleaned right out with a bit of work by the metal drain tape. 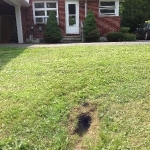 This entry was posted in exterior on July 22, 2013 by Douglas Camin.